Pictured here is a set of 4 wine glass charms in Chinese mid-autumn festival theme. Each has small decorations made to fit around the stems of wine glasses and metaphors elements of the festival including "Jade Rabbit" "full moon" "star fruit" "lantern". 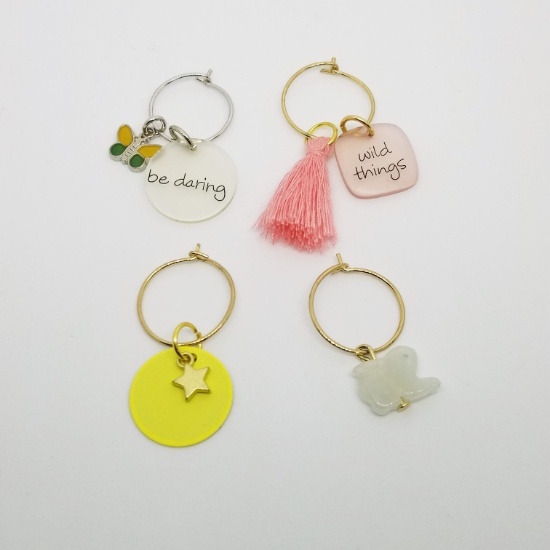 The wine glass charms allow easy identification of wine glasses and are eco-friendly to use. 4-piece wine glass charms set. With small decorations made to fit around the stems of wine glasses. Each metaphor elements of the festival including "Jade Rabbit" "full moon" "star fruit" "lantern". Allow easy identification of wine glasses. Help round out a theme in events/dinners/parties. Reusable and eco-friendly to use.